WASHINGTON, D.C. -- After rising following Donald Trump's election and inauguration, the percentage of Americans who frequently worry has receded, although it has not yet returned to its pre-election level. On average, over the past five months, 31.7% of Americans reported experiencing worry "a lot of the day yesterday." This was down from 33.3% during Trump's first month in office, but still above the 29.2% recorded the month before the Nov. 7 election. The 4.1-percentage-point increase in Americans experiencing significant worry on any given day occurred gradually between the election and the month following the inauguration. It was the largest increase in worry that Gallup and Sharecare have recorded over a four-month period since the Great Recession in 2008, and far larger than 0.9-point rise in worry measured after Barack Obama was elected in 2008. While down since Trump's first month in office, the percentage worried has receded to the level found during the pre-inaugural period, from Jan. 2-19, but is still 2.5 points higher than before Trump was elected. The large sample sizes involved in these averages means that even one-point differences in the percentage worried are statistically significant. The most recent results are based on nearly 75,000 interviews with U.S. adults from Feb. 17-July 17, 2017, as part of the Gallup-Sharecare Well-Being Index. Gallup and Sharecare ask U.S. adults, "Did you experience worry a lot of the day yesterday?" The survey does not prime respondents to think about worry in political terms, because it does not contain political questions or mention the election or Trump specifically. Gallup and Sharecare analyzed Americans' daily reports of worry during five periods: the month leading up to the Nov. 8 election (Oct. 1-Nov. 7), the month following the election (Nov. 9-30), before the inauguration (Jan. 2-19), the month after the inauguration (Jan. 21-Feb. 16), and months two through six of Trump's presidency (Feb. 17-July 17). After the Nov. 8 election, changes in worry followed expected partisan patterns. Democrats' worry spiked, independents' stayed about the same and Republicans' worry dropped. Following Trump's inauguration, Democrats' worry rose sharply, while independents' edged up slightly and Republicans' stayed about the same. Over the next five months, worry declined among all party groups -- back to where it was when Trump was inaugurated-- with the sharpest drop among Democrats. 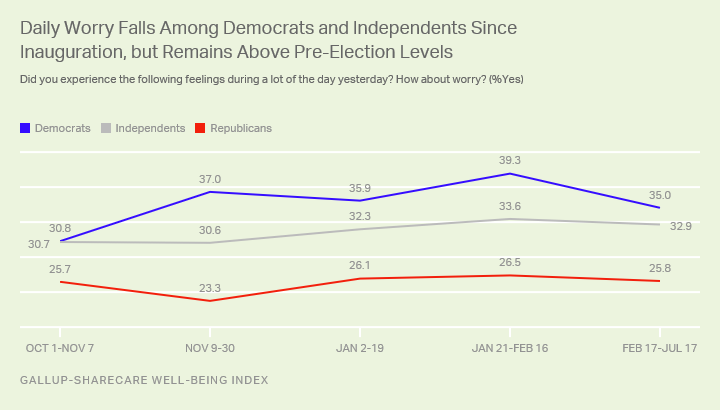 The percentage of Democrats worried is 4.2 points higher now than before the election, while the percentage of independents worried is 2.2 points higher. Republicans are no more worried now than they were before the election. Americans are less worried now than after President Trump first took office. While many studies documented a rise in anxiety after the election, this analysis is among the first to find that these negative emotions seem to be subsiding. Trump's more controversial actions -- including implementing the travel ban, withdrawing from the Paris climate change agreement, trying to repeal Obamacare and pursing a border wall -- have not resulted in a sustained increase in daily worry among Democrats and independents. In fact, the rise in worry after the election and inauguration seems to be dissipating, with Democrats and independents moving back toward their emotional status quo. Still, worry remains higher now than before Trump was elected, based on elevated levels among Democrats and independents. This increase in worry could affect their work, relationships and mental and physical health. In addition to individuals seeking professional help, workplaces, schools and community groups can foster the strong social and community bonds that help make people feel secure during uncertain times. Results are based on telephone interviews conducted Feb. 17-July 17, 2017, as part of the Gallup-Sharecare Well-Being Index survey, with a random sample of 74,462 adults, aged 18 and older, living in all 50 U.S. states and the District of Columbia. For results based on the total sample of national adults, the margin of sampling error is ±0.4 percentage point at the 95% confidence level. All reported margins of sampling error include computed design effects for weighting. Republican workers living in Democratic areas are more likely than those living elsewhere to say their work is affected by politics. The majority of workers say their companies have communicated about diversity and inclusion issues since the November election.